What happened to Week 5? I didn’t do my homework. 😦 The load was light, anyway, because of Thanksgiving in the U.S. Instead, I started working on my alpha prototype in Week 5, because I knew I wouldn’t be able to do it all in just the one week of Week 6. I have a new job (tell you about it when I take some photos! ), but haven’t managed to slough off the old one, yet…I’m giving my old boss till the Christmas holidays to find a replacement for me. So I worked 6 days last week, will work 6 days every week for the next 3 or so. Not so terrible, I’ll survive, but I haven’t had time to do any groceries or blogging or even laundry…it’s just a big grey block of work and, when I get home at night, The Prototype is waiting. So then I make a coffee and sew pockets until 1 or 2 in the morning, because I am not going to drop out in the last quarter, I’ve done way too much to just let it all go. By the way, the photo at the very start of this post is shows pages of our old marbling experiments journal. 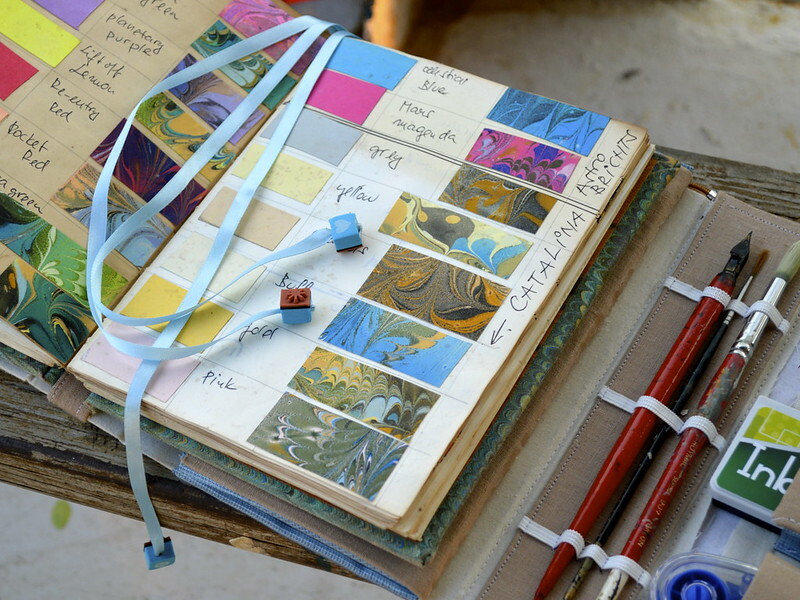 For a few years in the Philippines Kris and I marbled our own papers and fabrics for the journals we made; we weren’t using any of the proper stuff—there was no carrageenan, or special marbling paints, or ox gall. We used rain water, cheap local acrylic house paints, and manioc starch for the size. Still, we managed to get our patterns to a pretty good standard, amazingly. The green marbled fabric on the cover of the journal, in some of the photos below, is one of ours. 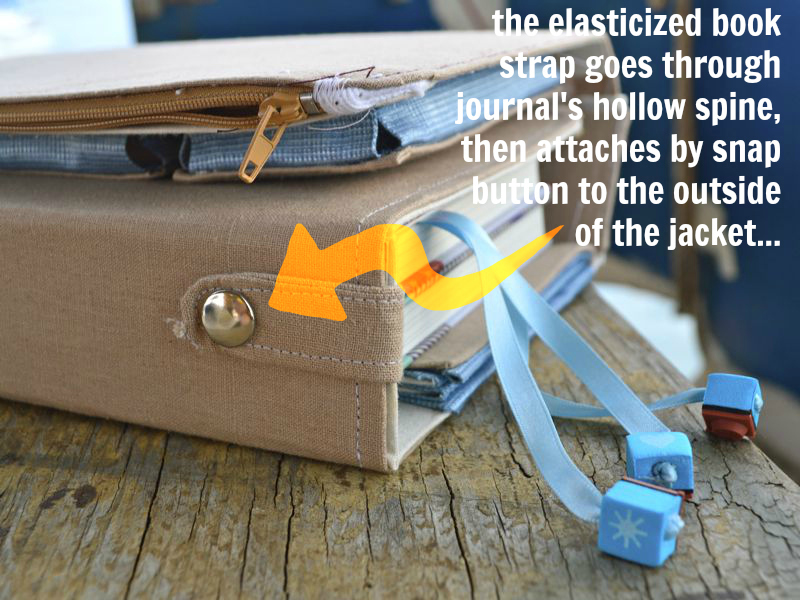 I envision a travel journal (book), together with a sturdy “jacket” that I can put the journal into. 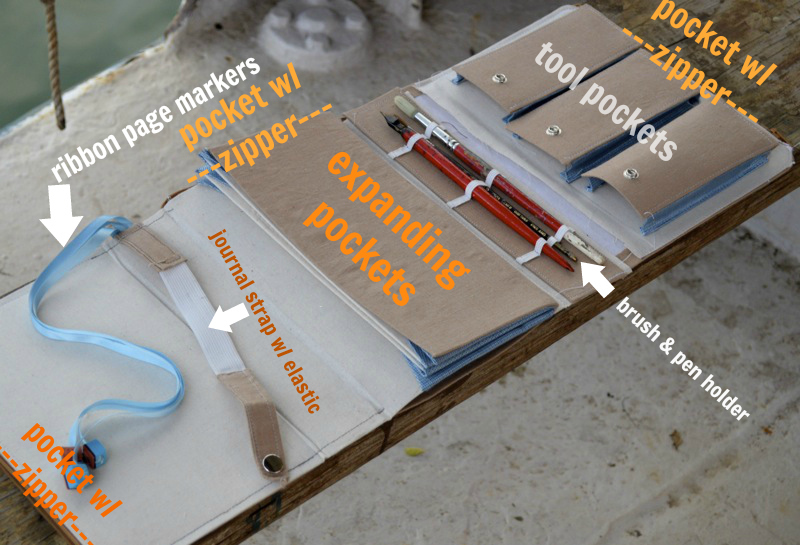 The jacket has multiple pockets to hold not only the maps and paraphernalia of traveling, but also the art materials he/she might use to create a more personalised and artistic journal. Unlike the journal—which I imagine will become an inactive but cherished receptacle for the traveler’s memories and impressions when it is filled—the jacket is re-usable. 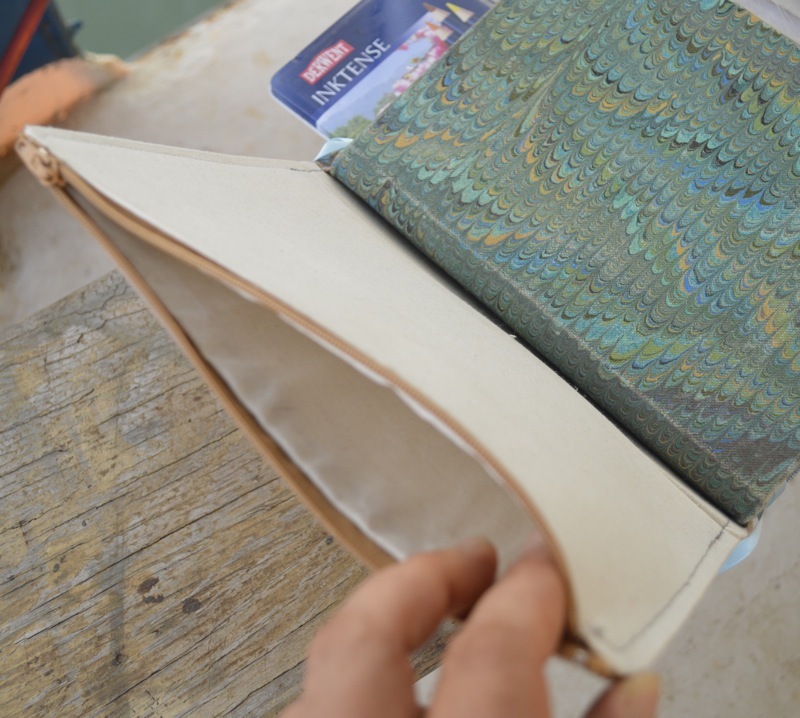 I work 6 days a week, so I didn’t have time to hand bind the travel journal (book) itself…sorry! But I’ve done so much work on this thing, already, that perhaps I should be viewing this “Travel Journal Jacket” as a separate design from the actual “Travel Journal”! Maybe I’ll just finish off the book part for the beta prototype next week. NOTE: The rubber stamps are a heart, a star, and an unhappy face, representing “Like this” (or “Love this”), “Important” and “Dislike this”. The stamps are meant to be used to flag entries where the traveller wants to rate an experience. 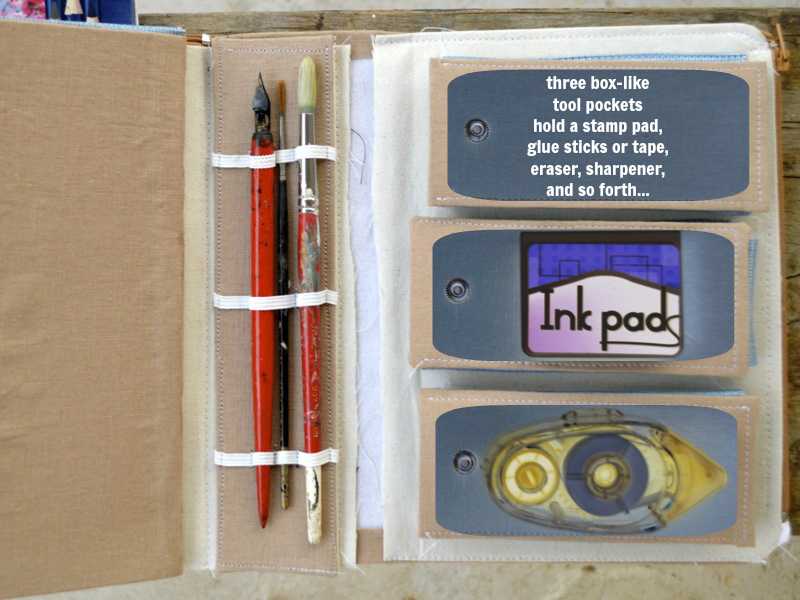 I found this solution preferable to Moleskine’s use of symbol stickers which, of course, always get used unevenly, and run out too soon. 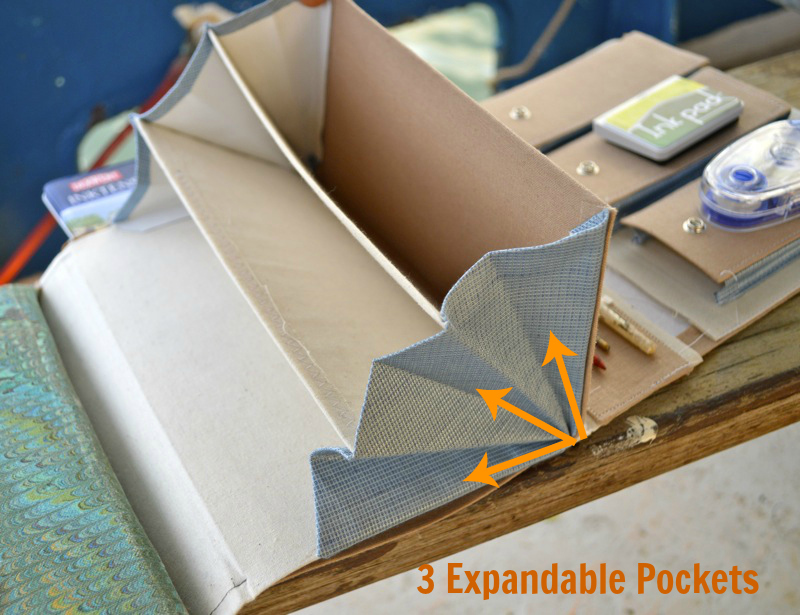 NOTE: There are three of these large pockets with zippers that run along the edge of the journal jacket…see first illustration for placement of all three. This is a great idea! I love it. I am learning more about making my own journals. New subscriber! 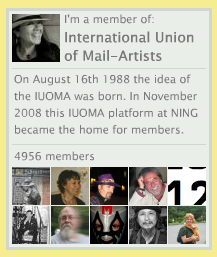 Thank you for commenting and following my blog. Practice makes perfect for making journals. This is a really amazing idea. It’s aesthetically pleasing yet practical. I would love to see a DIY tutorial for this! 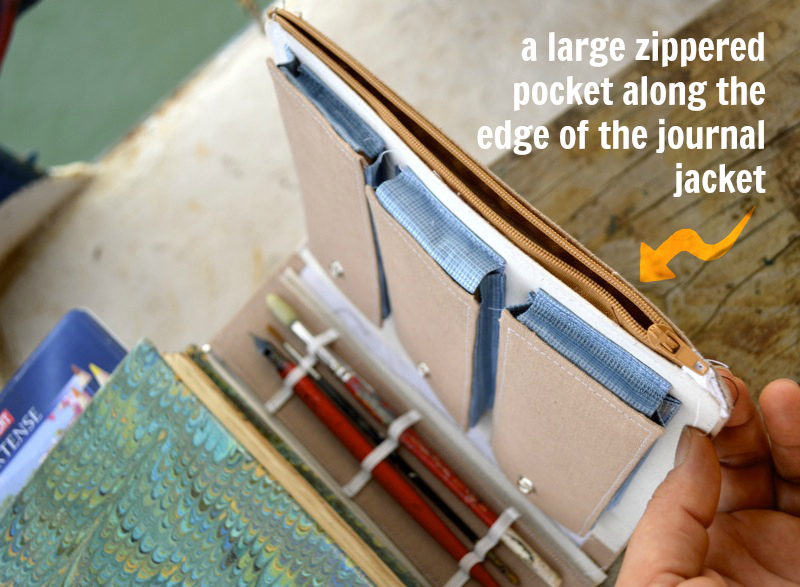 Wow, that is a great looking travel journal. Bookmarked this, to show to the wife. She will love it! Do you have a step by step instruction to build one of these or can I just pay you for one? show us how to make it!!! This is SO amazing! Please Please Please do a DIY, I need this in my life. This is legitimately AMAZING. Someone reblogged it on Tumblr and I’m completely freaking out. I would buy this. I would buy this so hard. I think you should be aware that on of the posts on tumblr that features this journal has recieved almost 7000 notes… today. If you would be able to produce these, I’m fairly sure you could sell a lot of these (read: make quite a bit of money). this is LOVELY!!! (came from Flickr) great work! This is incredible! I started making journals for my travels last year, but this is another beast althogether! I have so many ideas for my next one now…. amazing work! I think your Travel Journal is an Inspired work of Art, it’s got everything your likely to need,and it’s so stylish as well as being practical..
with pen n paper. all feeling just come straight forward. 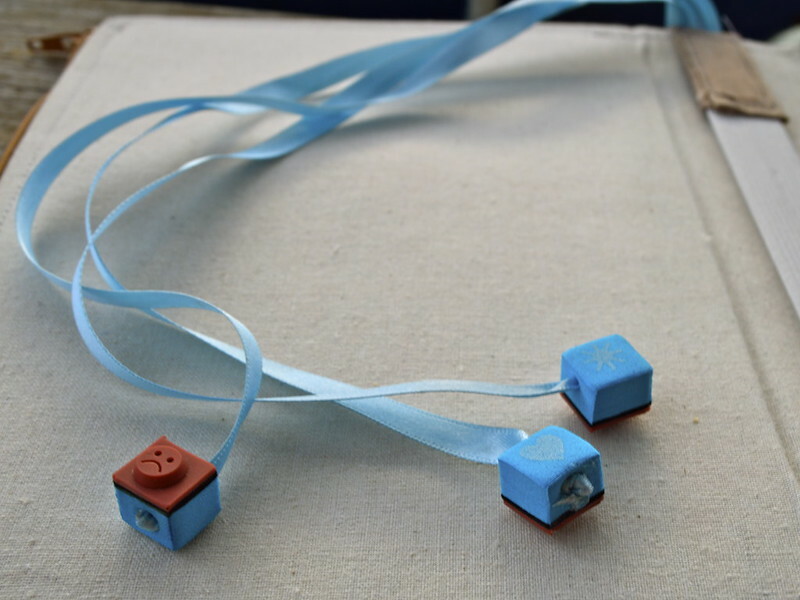 genius: love the stamps idea! I’m so proud of that idea! Thanks! This is really beyond amazing! I love your creativity! Thank you, Jason! That’s exactly what I was trying to do! The way I see it, creativity is as integral to life as clean underwear or money…can’t imagine being without a pen and paper ro doing some sort of doodle or sketch anymore than I can imagine being in a foreign country without money! i would love to have something like this. Very creative. you should think about making a few and selling them. I will, Monique! 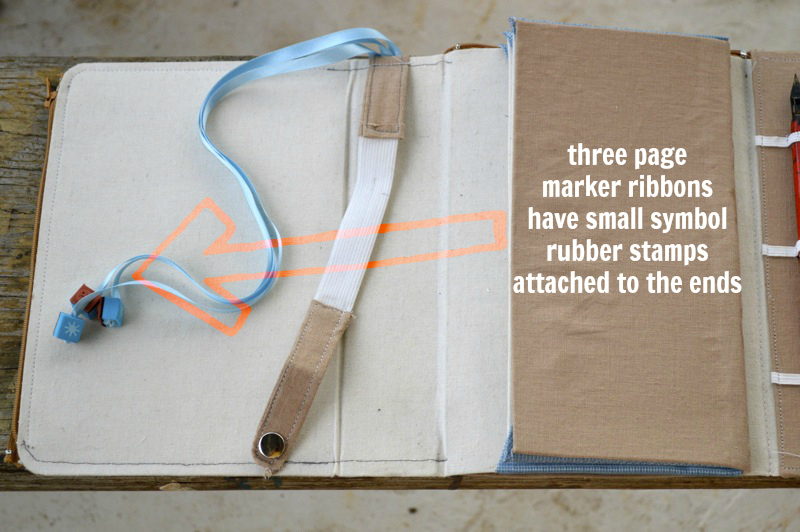 Or maybe something like a PDF with instructions for making your own? I would love to have the directions for making one. I’m going to Italy this summer and this is all sorts of perfect for it! So did I! This course really did something for me, I love seeing the way my own initial, limited ideas were pished into something more. I’m truly fascinated by your travel journal – amazing idea and keep up the great work (after work of course)! Your journal idea is so amazing! It has been a real joy to see it progress from week to week… you are so talented! What class are you taking for this?